Matching up with the ever increasing requirements of the customers, our company is engaged in providing Power Transmission Steel Pole. We deal in best quality of MS Pole and we offer them to our clients. This MS Pole can be used for commercial, residential, highways, gardens and municipal applications. Our offered range of pole is stylish and non-corrosive and is available in different sizes, color and designs. We produce quality poles with the State-of-the-art technology driven machinery integrated with Quality Assurance systems. Derrick poles are used during tower erection. These poles are fabricated from best quality steel pipes. The diameter of pipe depends upon the maximum bending moment acts on it during tower erection. With our expertise and trustworthiness, we are engaged in offering an optimum quality range of Swaged Steel Tubular Pole. Being a client centric organization, we are able to offer Steel Octagonal Poles. 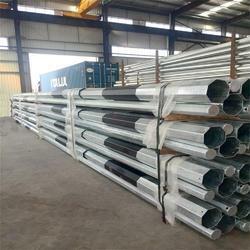 We are offering Steel Pole to our client.